After last Saturday’s historic blizzard, a friend from Minnesota commented that she has never more longed for the May flowers that April “showers” are supposed to bring. And that just the sight of a budding tree would lift her spirits with the promise of life returning. If we think about a visual experience that can brighten someone’s day, and then apply it to digital signage, we see that our amazing displays have the ability to connect with people’s emotions, magnify them or change them, depending on the content we use. A large 4K UHD display excels as a simulated window. If your building has an area without a view, think of the digital art you could create for a virtual window—breathtaking natural vistas, sparkling cityscapes, magnificent mountains—and then change it up from time to time. Or suppose you have a large lobby in a corporate headquarters. As employees enter the building how can you get them to feel appreciated? A video wall showing clips from a recent team-builder outing or company event could work. Your employees will appreciate seeing themselves on the big screen, and the recognition is sure to boost morale even further. Maybe you’re a retail store for outdoor adventure gear. Treat your customers to a high-res sunrise campsite tour in Yellowstone, or shredding the slopes in Vail. You’ll get them daydreaming about that vacation they’ve been putting off. With a touch-enabled display they could tap on products and get details instantly. If beacon and Bluetooth enabled they could buy them on the spot. Are you a luxury-performance automobile dealer? Consider a custom-made display to beautify your showroom with footage of your flagship vehicle in action. What do your customers want? To be in the driver’s seat. Get their adrenaline flowing and the goosebumps rising. On another note, a hospital stay is no fun for anyone. 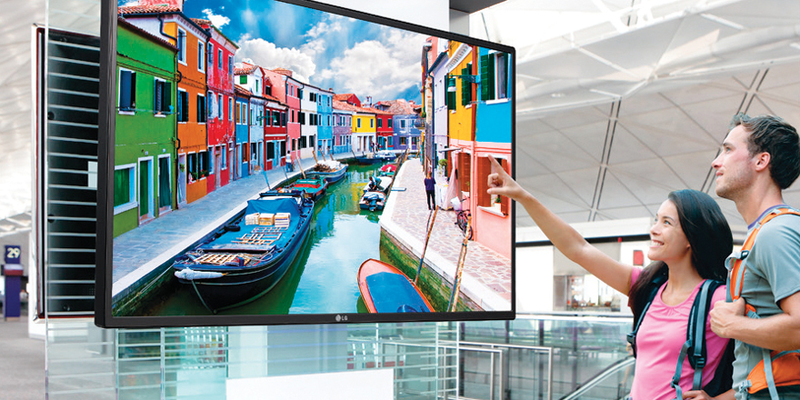 Here’s where large displays can do a world of good. Do you have a solarium in a children’s wing? A large video wall can transform into the observation window of a deep-sea aquarium exhibit. The kids can get really close, and the wonders of the sea will widen their eyes, and broaden their smiles. When you think about it, there’s really no business environment where you couldn’t use digital displays to tap into people’s emotions. And it doesn’t have to be all feel-good and thrill rides. Nonprofit organizations could use stirring images to further their cause, enhance fundraising efforts and turn visitors’ heartfelt concern into action. This is a fun exercise in visual brainstorming and we could go on and on. Try it yourself. Grab your team for half an hour, tell them what you want to accomplish, and watch them conjure up content ideas to engage, inspire and make any day look even better. Next week we’ll talk about the psychology of color, and how to use it to engage customers and influence their purchasing decisions.